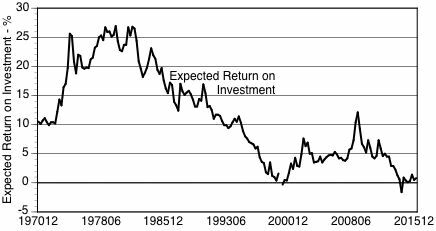 Expected returns of mutual funds that mirror S&P 500 are now below zero, if inflation is included. The reasons for such low returns can be found in still excessive levels of stock market capitalization. That is increasingly driven by corporations taking accumulation of excess cash balances and investing cash in the re-purchasing of stock. That keeps prices of shares up and uses up capital for financial manipulation rather than investments in a deteriorating infrastructure or improvements in employment-creating plants and equipment. CONCLUSION: Short-term consequences cannot be predicted, though a sudden drop of >40% in the value of S&P 500 is possible. Shocks to the global financial market are becoming increasingly unpredictable and can have origins from unknown sources.